Polisport Is Proud to Present Durable Gloss Polypropylene (DGP), the First Plastic Composition for Off-Road That Accommodates Maximum Gloss and High Resistance to BreakingInjection Molded Quality for a Easiest OEM Type FitExact Replica of Stock OEM PlasticInexpensive Alternative to OEM Replacement PartsPre-Drilled for Easiest Mounting Each TimeRPM Calibration (Offroad Version Only) Kit includes: Black rear fender, Orange front fender, Black side panels, Orange front number plate and Orange radiator scoops. 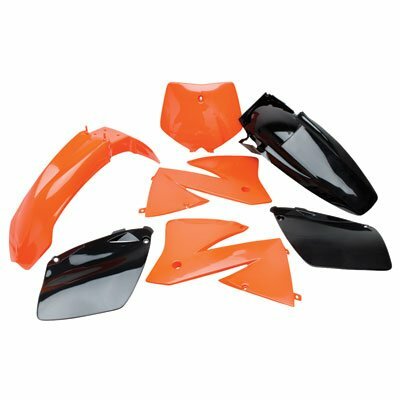 Fits the Following KTM Models:All SX Models 2001-2002125 EXC 2003525 EXC 2003Please Note: The Image Displayed Is Representative of the Item, but Shows a Number of Colors and Styles. You Will Receive Correct Plastic Kit for Your Application, Irrespective of Image Shown.